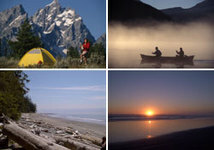 Seven Sisters Provincial Park and Seven Sisters Protected Area offer an exceptional, natural setting with the spectacular set of peaks visible from Highway 16 between Hazelton and Terrace in British Columbia. There are many recreational activities such as hiking and snowmobiling – two popular backcountry activities. The Park is known for a row of rugged peaks, four of which reach above 2,500 m in elevation. The Protected Area contains a complete sequence of forested ecosystems from valley bottom to alpine – a unique blend of coastal, interior and northern features and a habitat for many red- and blue-listed species of wildlife. The 39,206 hectares Park has an abundance of wildlife: mountain goat herds use the Seven Sisters peaks and ridges during the summer, and winter in the forests near Oliver Creek and Hells Bells Creek. Black bears, Grizzly, raptors and other birds use the entire Protected Area. In the forested area of the lower elevation, marten live in the older forests, while moose, mule deer, coyotes and wolves tend to use the area around natural openings, burned areas and old cutblocks. Formal land use planning began in 1989. The Kispiox Resource Management Plan recommended the Seven Sisters as a study area in 1991. Three years later, a Kispiox planning group considered land uses in the Seven Sisters. In 1999, the Provincial Government announced Seven Sisters Provincial Park. Since the late 1920s, the area around the Seven Sisters mountain range has stimulated interest in mineral exploration. Discoveries in the headwaters of Oliver Creek included veins with gold, silver, lead and zinc. Several log cabins were built to facilitate exploration at the time. Exploration continued between 1968 and 1983, including aeromagnetic, gravity, magnetic and geochemical surveys and trenching to expose bedrock in areas of interest, however no mineral occurrences were considered to be economically viable for mining. Remnants of that mining exploration history are Oliver Creek Trail and Coyote Creek Trail, as well as a few dilapidated buildings outside the Protected Area at the abandoned Magnetron Site on the Coyote Creek Trail. Resident mountain goat herds use the Seven Sisters peaks and ridges during the summer, and winter in the forests near Oliver Creek and Hells Bells Creek. The mountain goats are monitored closely, as they are very sensitive to changes in habitat, noise levels and hunting pressures. Black bears and Grizzly (blue-listed), raptors and other birds use the entire Protected Area whereas marten and fisher (blue-listed) use the older forests. Moose, mule deer, coyotes and wolves tend to use the area around natural openings, burned areas and old cutblocks. The low elevation forest between Hells Bells Creek and Oliver Creek provides mule deer winter range. High elevation wetlands in the Upper Price Creek drainage are likely important for migratory waterfowl in spring and fall. Tailed frogs (blue-listed) have been found across the Skeena River from Oliver Creek. Breeding populations of rough-skinned newts live in small ponds near Coyote Creek at the northern extent of their range. Trout live within most lakes and creeks and Salmon pass through the lower reaches of all creeks. Backcountry and wilderness camping is allowed in the Seven Sisters Park and Protected Area. Only limited facilities are provided. There are picnic tables and fire rings available along the Watson Lakes trail. Two old trappers’ cabins are located along the Oliver Creek trail. Well maintained trail that passes three small lakes with picnic sites and fishing – an easy 3 km hike (200m elev. gain) through scenic landscape. Families with small children and novice hikers can easily reach the scenic lakeside picnic/camping site 1km along the 3km trail. The 7.2 km trail starts out relatively level and traverses pleasant mature forest for the first 3 km. Then a difficult creek crossing at Whiskey Creek ascends steeply through mixed forest types to join up with the upper reaches of the creek below a headwall and glacier, providing spectacular scenery and access for mountaineering. This trail is ideal for overnight backpacking trips, connecting with both Flint Creek and Coyote Creek roads and passing two old trapper cabins and beautiful subalpine meadows. Provides access to alpine hiking and the Seven Sisters peaks. This old mining road begins behind a gravel pit on Hwy 16, about 6 km north of Oliver Ck. The trail is 17 km long and climbs 1500 metres over its entire length, passing through wide a variety of forest types and ending in a spectacular alpine basin. Seven Sisters Park and Protected Area offers a pleasant and quiet picnicking opportunity. Families with small children and novice hikers can easily reach the scenic lakeside picnic/camping site 1km along the 3km Watson Lakes Trail.